Pro-life protesters, displaying graphic images of aborted fetuses, camped out in front of the library late in the morning on Tuesday, Mar. 4. The protest resulted in an altercation between the pro-life proponents and an unknown feminist studies professor, witnesses said. “A crazy professor stole our sign and ran off with it,” said one of the pro-life protesters, who wishes to remain anonymous. She is a member of Students for Life of America, a student organization dedicated to “[ending] abortion by educating students about the issues of abortion, euthanasia, and infanticide; identifying pro-life student leaders; equipping student pro-lifers with the training, skills, and resources to be effective and successful; [and] promoting student activity to other local, college, and national organizations,” according to the UCSB chapter’s Facebook page. However, UCSB’s chapter of Students for Life was not involved in organizing the protest on Tuesday, and it is not officially associated with the group of protesters. Other protesters discussed the altercation with University of California, Santa Barbara police officers who were called to the scene. Students tabling nearby for CALPIRG witnessed the altercation in its entirety. 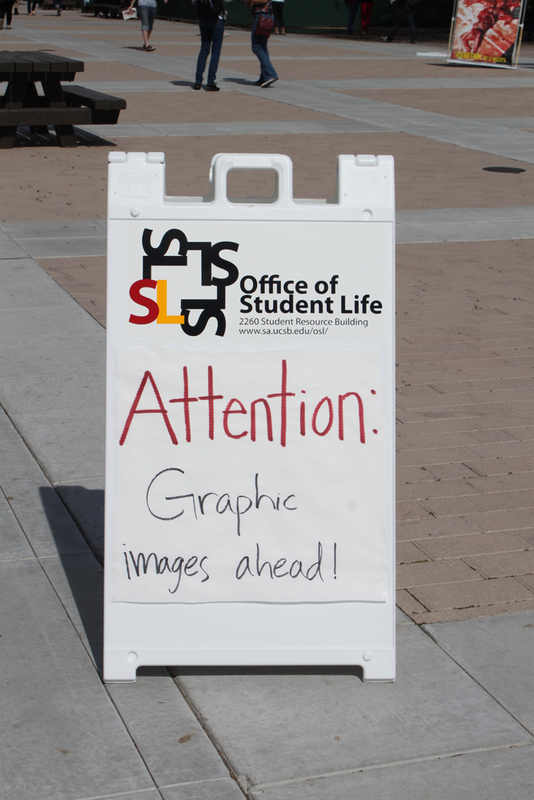 Another CALPIRG member explained that the protest had already caused problems with the Office of Student Life, which requires that organizations obtain permission before displaying graphic images on campus. Student Life officials had already been at the scene. They posted signs on each end of the Arbor warning students about the graphic images ahead. Generally speaking, it seemed that the pro-life protesters were not well received. The large majority of UCSB students passing by refused the graphic pamphlets and muttered about the proceedings to their friends. One student, who wishes to remain anonymous, was especially heated about the issue.